I’m wild for rhubarb. Especially after a sweet fairy went poking around all over Minneapolis a week ago on the hunt for rhubarb for me to bring home to Texas, where rhubarb season lasts about 15 minutes. She came through. And, now, so will I. As promised in the Rhubarb Fest 2011 post from last week, here are my gluten-free versions of the baked goods in question. 1. Place 7 cups (1 lb 15 oz) chopped rhubarb into a large mixing bowl. 4. Chop up a cold stick of butter and then use a fork or fancy pie-crust thingy to incorporate the cold butter into the flour mix. Incorporate until you have roughly pea-sized crumbles of the butter interspersed throughout the dry ingredients. 5. 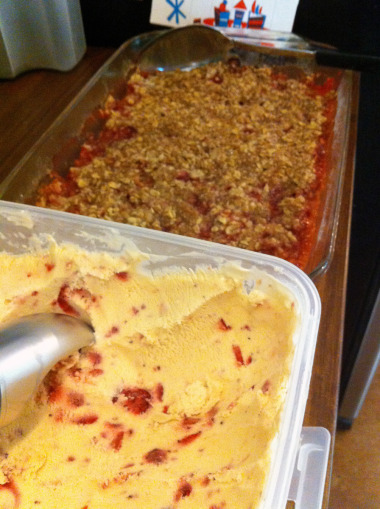 Pour rhubarb mixture into a buttered (or greased) 9” x 13” glass pan and sprinkle crumbles evenly over the top to cover. Bake for 35-40 min (until it’s bubbly and seeping up through the crisp throughout). And, remember how I posted a picture of my gluten-free’ified rhubarb streusel muffin on Facebook and you all went wild and said I was teasing by not posting the recipe. Well, my dears, here you are. 1. You’re going to use a lot of dishes to make this. 2. It’s not a particularly easy recipe, meaning, there are a few steps and multiple preparations within those steps. Read through the recipe a few times to get a feel for what needs to happen and in what bowl. 3. You’ll forget all about the work you did to make these because they’re perfect and delicious and even marginally healthy. Also of note, I didn’t have the 3/4 cup sour cream, so I subbed 3/4 cup whole milk and added 1 tsp lemon juice (sour cream and buttermilk share the same bacteria and acidity composition, so your no-buttermilk solution will work here too! ).